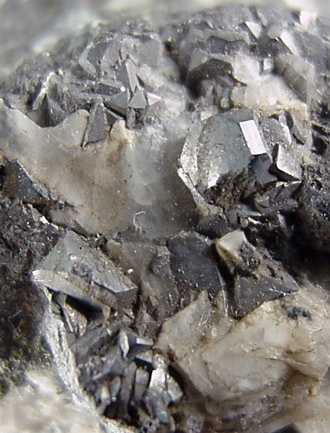 Skutterudite: Mineral information, data and localities. Named in 1845 by Wilhelm Karl von Haidinger after its discovery locality, Skutterud, Modum, Norway. The earliest name that possibly refers to any skutterudite-like material, cobaltum eineraceum, was introduced by Georgius Agricola in 1529. Wallerius used several names for a skutterudite-like mineral (kobaltglants, kobaltmalm, minera cobalti cinerea, cobaltum arsenico mineralisatum). 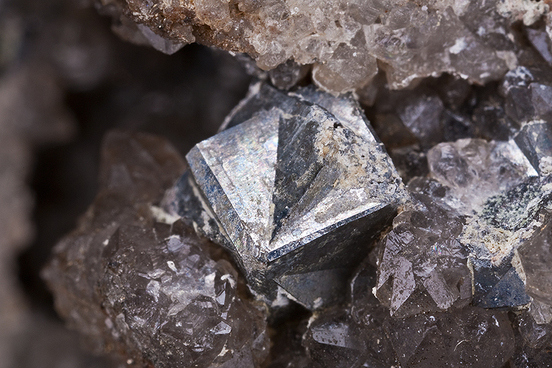 Named speiskobalt by Werner (see Hausmann, 1813), but also seemingly equally applied to safflorite and smaltite. Arsenikkobaltkies was used by Karl Johann August Theodor Scheerer for Norwegian skutterudite in 1837 and Arsenikkobalt was used in 1852 by Gustav Rose. 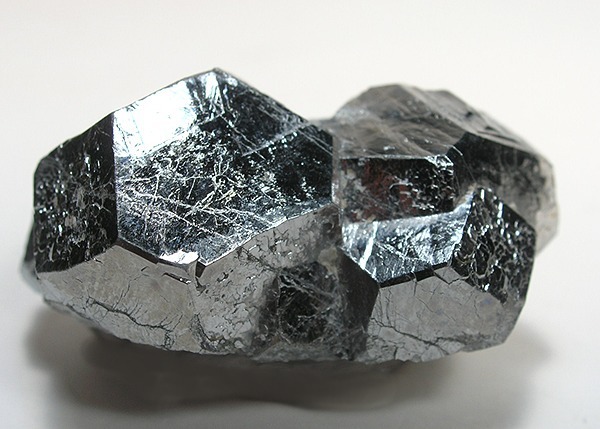 The cobalt analogue of Ferroskutterudite and Nickelskutterudite. Chemical formula revised by the IMA in January 2017. Erythrite 50 photos of Skutterudite associated with Erythrite on mindat.org. Calcite 37 photos of Skutterudite associated with Calcite on mindat.org. Safflorite 35 photos of Skutterudite associated with Safflorite on mindat.org. Nickeline 23 photos of Skutterudite associated with Nickeline on mindat.org. Silver 23 photos of Skutterudite associated with Silver on mindat.org. Quartz 17 photos of Skutterudite associated with Quartz on mindat.org. Bismuth 10 photos of Skutterudite associated with Bismuth on mindat.org. Arsenopyrite 7 photos of Skutterudite associated with Arsenopyrite on mindat.org. Gersdorffite 7 photos of Skutterudite associated with Gersdorffite on mindat.org. Proustite 6 photos of Skutterudite associated with Proustite on mindat.org. Breithaupt, A. (1827) Ueber eine neue Kies-Spezies von Skutterud. Annalen der Physik und Chemie: 9: 115-116 [Tesseralkies, Hartkobaltkies]. Scheerer, T. (1837) Ueber zwei norwegische Kobalterze von den Skutteruder Gruben. Annalen der Physik und Chemie: 42: 546-555. [Arsenik-kobaltkies]. Haidinger, W. (1845) Zweite Klasse: Geogenide. XIII. Ordnung. Kiese III. Kobaltkies. Skutterudit. in Handbuch der bestimmenden Mineralogie, enthaltend die Terminologie, Systematik, Nomenklatur und Charakteristik der Naturgeschichte des Mineralreiches, 650 pp. Braumüller & Seidel, Wien, p. 559-562. [Skutterudit]. Hausmann, J.F.L. (1847) Handbuch der Mineralogie. Zweiter Theil. System und Geschichte der Mineralkörper, 2nd edition. p. 69. [Hartkobalterz]. Nicol, J. (1849) Manual of Mineralogy or the Natural History of the Mineral Kingdom. Adam and Black, Edinburg, p. 457. [Modumite]. Samdahl, B. (1925) Analyse der Skutterudits. Norsk Geologisk Tidsskrift: 8: 63-73. Oftedal, I. (1926) The crystal structure of skutterudite and related minerals. A preliminary paper. Norsk Geologisk Tidsskrift 8: 250-257 + plate. Oftedal, I. (1928) Die Kristallstruktur von Skutterudit und Speiskobalt-Chloanthit. Zeitschrift für Kristallographie: 66: 517-546. Fleischer, M. (1943) New mineral names. American Mineralogist: 28: 61-64. Palache, C., Berman, H., Frondel, C. (1944) The System of Mineralogy of James Dwight Dana and Edward Salisbury Dana Yale University 1837-1892, Volume I: Elements, Sulfides, Sulfosalts, Oxides. John Wiley and Sons, Inc., New York. 7th edition, revised and enlarged: 342-347. Holmes, R.J. (1947) Higher mineral arsenides of cobalt, nickel, and iron. Bulletin of the Geological Society of America: 58: 299-392. Fleischer, M. (1948) New mineral names. American Mineralogist: 33: 98-100. Ventriglia, U. (1957) Studi strutturali sugli arseniuri di cobalto. Periodico di Mineralogia: 26: 345-383. Roseboom, E.H. (1962) Skutterudites (Co,Ni,Fe)As3-x: Composition and cell dimensions. American Mineralogist: 47: 310-327. Klemm, D.D. (1965) Untersuchungen mit der Elektronenmikrosonde über die natürlichen Mischkristallbereiche der Skutterudite. Contributions to Mineralogy and Petrology: 11: 323-333. Radcliffe, D. (1968) Structural formula and composition of skutterudite. Canadian Mineralogist: 9: 559-563. Nickel, E.H. (1969) The application of ligand-field concepts to an understanding of the structural stabilities and solid-solution limits of sulphides and related minerals. Chemical Geology: 5: 233-241. Canadian Mineralogist (1971) 9: 559. Mandel, N., Donohue, J. (1971) The refinement of the crystal structure of skutterudite, CoAs3. Acta Crystallographica: B27: 2288-2289. Kjekshus, A., Rakke, T. (1974) Compounds with the skutterudite type crystal structure. III. Structural data for arsenides and antimonides. Acta Chemica Scandinavica: A28: 99-103. Pauling, L. (1978) Covalent chemical bonding of transition metals in pyrite, cobaltite, skutterudite, millerite and related minerals. The Canadian Mineralogist: 16: 447-452. Anno, H., Matsubara, K., Caillat, T., Fleurial, J.P. (2000) Valence-band structure of the skutterudite compounds CoAs3, CoSb3, and RhSb3 studied by X-ray photoelectron spectroscopy. Physical Review B: 62: 10737-10743. Prytz, Ø., Taftø, J., Ahn, C.C., Fultz, B. (2007) Transition metal d-band occupancy in skutterudites studied by electron energy-loss spectroscopy. Physical Review B: 75: 125109-6. Hazen, R.M., Hystad, G., Golden, J.J., Hummer, D.R., Liu, C., Downs, R.T., Morrison, S.M., Ralph, J., Grew, E.S. (2017) Cobalt mineral ecology. American Mineralogist: 102: 108-116. Schumer, B.N., Andrade, M.B., Evans, S.H., Downs, R.T. (2017) A new formula and crystal structure for nickelskutterudite, (Ni,Co,Fe)As3, and occupancy of the icosahedral cation site in the skutterudite group. American Mineralogist: 102: 205-209. Hålenius, U., Hatert, F., Pasero, M., Mills, S.J. (2017) IMA Commission on New Minerals, Nomenclature and Classification (CNMNC) Newsletter 35. New minerals and nomenclature modifications approved in 2016 and 2017. Mineralogical Magazine: 81: 209-213. The following Skutterudite specimens are currently listed for sale on minfind.com. GSC Paper 69-50, Ann P. Sabina, Pg.132. Hawley, J.E. & Stanton, R.L. (1962): The Sudbury ores: their mineralogy and origin. Part II. The facts: The ores, their minerals, metals and distribution, Canadian Mineralogist 7, 30-145. Satterly, J. 1977: A Catalogue of the Ontario Localities Represented by the Mineral Collection of the Royal Ontario Museum; Ontario Geological Survey Miscellaneous Paper MP70,464p. geological survey of canada paper 73-13; Satterly, J. (1977) A Catalogue of the Ontario Localities Represented by the Mineral Collection of the Royal Ontario Museum; Ontario Geological Survey Miscellaneous Paper MP70,464p. Ontario Dept. of Mines, 1968, MRC No.10, Silver Cobalt Calcite Vein Deposits of Ontario, by A.O.Sergiades, p. 126. Dana 7:I:343.; Satterly, J. 1977: A Catalogue of the Ontario Localities Represented by the Mineral Collection of the Royal Ontario Museum; Ontario Geological Survey Miscellaneous Paper MP70,464p. Dana 7:I:311.; Am Min (1940), 25:561-577; Satterly, J. (1977) A Catalogue of the Ontario Localities Represented by the Mineral Collection of the Royal Ontario Museum; Ontario Geological Survey Miscellaneous Paper MP70,464p. ontariominerals.com; Satterly, J. (1977) A Catalogue of the Ontario Localities Represented by the Mineral Collection of the Royal Ontario Museum; Ontario Geological Survey Miscellaneous Paper MP70,464p. Satterly, J. 1977: A Catalogue of the Ontario Localities Represented by the Mineral Collection of the Royal Ontario Museum; Ontario Geological Survey Miscellaneous Paper MP70,464p. ; Satterly, J. (1977) A Catalogue of the Ontario Localities Represented by the Mineral Collection of the Royal Ontario Museum; Ontario Geological Survey Miscellaneous Paper MP70,464p. Dana 7:I:300.; Satterly, J. (1977) A Catalogue of the Ontario Localities Represented by the Mineral Collection of the Royal Ontario Museum; Ontario Geological Survey Miscellaneous Paper MP70,464p. Miller Willet. G. (1907): Cobalt - Nickel Arsenide and Silver, Chapter 1; Sixteenth Annual Report of The Bureau of Mines; Vol. 16, Pt. 2, Pg. 10, 12. Knight, Cyril W. (1922). Geology of The Mine Workings of Cobalt and South Lorraine Areas; Thirty - First Annual Report of the Ontario Department of Mines, Vol. 21, Pt.2, P. 49. Sergiades,A.O. 1968. Silver Cobalt Calcite Vein Deposits of Ontario, ODM, Mineral Resources Circular No.10, P. 202. Satterly J., (1977): A Catalogue of The Ontario Localities Represented by The Mineral Collection of The Royal Ontario Museum, Geological Survey of Canada, Miscellaneous Paper MP70, P. 358.
ⓘ Silver Miller Mine (Pan Silver) ? Mining and scientific press, Volume 97 p 663; Satterly, J. (1977) A Catalogue of the Ontario Localities Represented by the Mineral Collection of the Royal Ontario Museum; Ontario Geological Survey Miscellaneous Paper MP70,464p. Dana 7:I:193-194.;Am Min (1940), 25:561-577; Satterly, J. (1977) A Catalogue of the Ontario Localities Represented by the Mineral Collection of the Royal Ontario Museum; Ontario Geological Survey Miscellaneous Paper MP70,464p. SABINA, A.P. (2003): Rocks & Minerals for the collector; Kirkland Lake - Rouyn-Noranda - Val d'Or, Ontario & Quebec. GSC Misc. Report 77, 134. Boulanger, R. A. (2012). Geological, petrographic and geochemical characterization of the Roughrider West Zone unconformity-type uranium deposit, Athabasca Basin, Saskatchewan (Masters thesis, Faculty of Graduate Studies and Research, University of Regina). sample preserved in the Ignacio Domeyko collection, at Geological Department of La Serena University. Tvrdý, J. & Plášil, J. (2010): Jáchymov - Reiche Erzlagerstätte und Radonbad im böhmischen Westerzgebirge. Aufschluss 61, 277-292. Plášil, J., Čejka, J., Sejkora, J., Hloušek, J., Goliáš, V. (2009): New data for metakirchheimerite from Jáchymov (St. Joachimsthal), Czech Republic. Journal of Geosciences, 54, 373-384. Staude, S., Werner, W., Mordhorst, T., Wemmer, K., Jacob, D. E., & Markl, G. (2012). Multi-stage Ag–Bi–Co–Ni–U and Cu–Bi vein mineralization at Wittichen, Schwarzwald, SW Germany: geological setting, ore mineralogy, and fluid evolution. Mineralium Deposita, 47(3), 251-276. Walenta: "Die Mineralien des Schwarzwaldes", Weise (Munich), 1992; Meshik, A.P., Lippolt, H.J., and Dymkov, Y.M. (2000): Mineralium Deposita 35, 190-205. Walenta, K. (1992) Die Mineralien des Schwarzwaldes und ihre Fundstellen. Christian Weise Verlag, München, 336 pages. (in German). KOLITSCH, U. (1996): Cobaltit, Skutterudit und Alloklas von der Grube Clara bei Oberwolfach. - Erzgräber 10 (1), 56-59. Weiss: "Mineralfundstellen, Deutschland West", Weise (Munich), 1990; Knauer, E. and Richter, P. (1968): Ore minerals in the gold quartz veins near Brandholz, in the Fichtelgebirge. Neues Jahrbuch für Mineralogie, Monatshefte 1968, 463-471 (in German). ⓘ Hilfe Gottes Mine ? Seeliger, E. & Strunz, H. (1965): Erzpetrographie der Uranmineralien von Wölsendorf. II. Brannerit, Lermontovit(? ), Selen und Selenide, Ni- and Bi-Begleitmineralien etc. Neues Jahrbuch für Mineralogie, Abhandlungen 103, 163-178.; Dill, H. G., & Weber, B. (2010). Accessory minerals of fluorite and their implication regarding the environment of formation (Nabburg–Wölsendorf fluorite district, SE Germany), with special reference to fetid fluorite (“Stinkspat”). Ore Geology Reviews, 37(2), 65-86. Schmitt, T., (1993): Wismutminerale aus den Barytgängen des Spessarts, Der Aufschluss, Vol. 44, pp. 329-336; Wagner, T., Lorenz, J. (2002) Mineralogy of complex Co-Ni-Bi vein mineralisation, Bieber deposit, Spessart, Germany. Mineralogical Magazine, 66, 385-407. Nickerl, F., and Röthig, H. (2000): Verzeichnis der Berggebäude von Cunersdorf 1500-1900. Streifzüge durch die Geschichte des oberen Erzgebirges, Bergbaunachrichten. Arbeitskreis Annaberg-Buchholzer Heimatforscher, 20 pp. Nickerl, F., and Röthig, H. (2000): Verzeichnis der Berggebäude von Frohnau 1500-1900. Streifzüge durch die Geschichte des oberen Erzgebirges, Bergbaunachrichten. Arbeitskreis Annaberg-Buchholzer Heimatforscher, 192 pp. Nickerl, F., and Röthig, H. (2000): Verzeichnis der Berggebäude von Kleinrückerswalde 1500-1900. Streifzüge durch die Geschichte des oberen Erzgebirges, Bergbaunachrichten. Arbeitskreis Annaberg-Buchholzer Heimatforscher, 48 pp. Baumann, L., Kuschka, E., and Seifert, T. (2000): Lagerstätten des Erzgebirges. Enke (Stuttgart), 300 pp. Nickerl, F., and Röthig, H. (2000): Verzeichnis der Berggebäude von Dörfel 1500-1900. Streifzüge durch die Geschichte des oberen Erzgebirges, Bergbaunachrichten. Arbeitskreis Annaberg-Buchholzer Heimatforscher, 48 pp. Nickerl, F., and Röthig, H. (2000): Verzeichnis der Berggebäude von Hermannsdorf 1500-1900. Streifzüge durch die Geschichte des oberen Erzgebirges, Bergbaunachrichten. Arbeitskreis Annaberg-Buchholzer Heimatforscher, 52 pp. Autorenkollektiv. CD: Wismut. Chronik der Wismut. Abschn. 1.3.5., 2.2.7.; Wismut GmbH.1999. Nickerl, F., and Röthig, H. (2000): Verzeichnis der Berggebäude von Scheibenberg 1500-1900. Streifzüge durch die Geschichte des oberen Erzgebirges, Bergbaunachrichten. Arbeitskreis Annaberg-Buchholzer Heimatforscher, 36 pp. ex- Dr Gunther Grundmann collection, collected from a dump. Nickerl, F., and Röthig, H. (2000): Verzeichnis der Berggebäude von Schlettau 1500-1900. Streifzüge durch die Geschichte des oberen Erzgebirges, Bergbaunachrichten. Arbeitskreis Annaberg-Buchholzer Heimatforscher, 124 pp. Palache, C., Berman, H., & Frondel, C. (1951), The System of Mineralogy of James Dwight Dana and Edward Salisbury Dana, Yale University 1837-1892, Volume II: 1093. Nickerl, F., and Röthig, H. (2000): Verzeichnis der Berggebäude von Walthersdorf 1500-1900. Streifzüge durch die Geschichte des oberen Erzgebirges, Bergbaunachrichten. Arbeitskreis Annaberg-Buchholzer Heimatforscher, 8 pp. Bersani, D., Salvioli-Mariani, E., Mattioli, M., Menichetti, M., & Lottici, P. P. (2009). Raman and micro-thermometric investigation of the fluid inclusions in quartz in a gold-rich formation from Lepaguare mining district (Honduras, Central America). Spectrochimica Acta Part A: Molecular and Biomolecular Spectroscopy, 73(3), 443-449. Mattioli, M., Menichetti, M., Renzulli, A., Toscani, L., Salvioli-Mariani, E., Suarez, P., & Murroni, A. (2014). Genesis of the hydrothermal gold deposits in the Canan area, Lepaguare District, Honduras. International Journal of Earth Sciences, 103(3), 901-928. Venerandi Pirri, I. (1977): Le paragenesi a Zn, Cu, Pb, Sb, Hg, Ni, As, fluorite, barite nel Devoniano della Catena Carnica. Rend. Soc. Ital. Mineral. Petrol., 33, 821-844. Naitza, S., Garbarino, C., Secchi, F., and Tocco, S. (2013) The Ni-Co hydrothermal ore deposits of the Arburese Variscan district (SW Sardinia, Italy). Atti del Congresso FIST GEOITALIA 2013 – IX Forum di Scienze della Terra, Pisa, 16-18 Settembre 2013, 80. Jervis, G. (1881) I tesori sotterranei dell'Italia. Vol. 3: Regioni delle Isole. Sardegna e Sicilia. Addenda ai precedenti volumi. Ermanno Loescher, Torino, XXII+539 pp. ; Dessau, G. (1936) I minerali dei filoni a nichelio e cobalto dell’ Arburese (Sardegna). Periodico di Mineralogia, 7 ,21–39; Billows, E. (1941) I minerali della Sardegna e i loro giacimenti. Tipografia V. Musanti, Cagliari, 167 pp. ; Stara, P., Rizzo, R., and Tanca, G.A. [with contributions of Vinci, A., and Astolfi, M.] (1996) Iglesiente e Arburese. Miniere e Minerali. Associazione Mineralogica Sarda, Associazione Mineralogica Domusnovas, Gruppo Mineralogico Arburese, Gruppo Mineralogico Paleontologico Piacentino, Gruppo Mineralogico Lombardo et al. Ed., Siena, Vol. 2, 192 pp. Piepoli, P. (1934) Étude microscopique de quelques minerais du filon cobalto-nickélifère de Riu Planu is Castangias (Gonnosfanadiga, Sardaigne). Bulletin de la Société française de minéralogie, 57, 7-8, 270-282. Folie K. (1987): Silber, Kupfer, Blei.... Bergbaugeschichte und Mineralien in Sudtirol. Tappainer, Bolzano, 103pp. Pavlova, Z. N.; Nuralin, N. N.; Bakarasov, E. V.; Bakarasov, V. E. (1997): Mineralogy of the Shaman-​Aibat (Kazakhstan) cupriferous sandstone-​type copper ore deposit. Geologiya Kazakhstana 1997 (1), 65-74 (in Russian). Azmi, D. E., Aissa, M., Ouguir, H., Mahdoudi, M. L., El Azmi, M., Ouadjo, A., & Zouhair, M. (2014). Magmatic context of Bou Skour copper deposit (Eastern Anti-Atlas, Morocco): Petrogrography, geochemistry and alterations. Journal of African Earth Sciences, 97, 40-55. Praszkier, T. (2010): Mineralogische Bonanzas - die Funde der letzten beiden Jahre in Bou Azzer, Marokko. Mineralien-Welt 21 (2), 68-77. Hoehne K. 1936: Über einige Arsen-, Nickel-, Kobalt-, Silber-, Wismut- und Uranerzführende Kalkspatgänge dre Grube Bergfreiheit zu Oberschmiedeberg im Riesengebirge. Chem d. Erde Bd 10; Econ Geol (1997) 92:468-484; Mochnacka, K., Banaś, M. (2000): Occurrence and genetic relationships of uranium and thorium mineralization in the Karkonosze-Izera Block (The Sudety Mts, SW Poland). Annales Societatis Geologorum Poloniae: 70: 137-150; Mochnacka, K., Oberc-Dziedzic, T., Mayer, W., & Pieczka, A. (2015). Ore mineralization related to geological evolution of the Karkonosze–Izera Massif (the Sudetes, Poland)—Towards a model. Ore Geology Reviews, 64, 215-238. Zajzon, N., Bûdi, N., Szakáll, S. & Mátyási, S. (2006) Preliminary Study Of The Ore Minerals Of The “Avram Iancu” Co-ni-u Ore Deposit, Bihor Mts., Romania. Acta Miner.-Petrograph.,Abstract Series 5, Szeged, p.132; Zajzon, N., Szentpéteri, K., Szakáll, S., & Kristály, F. (2015). The origin of the Avram Iancu U–Ni–Co–Bi–As mineralization, Băiţa (Bihor) metallogenic district, Bihor Mts., Romania. International Journal of Earth Sciences, 104(7), 1865-1887. Keren Tan (1998): Gold Science and Technology 6(4), 29-37; http://www.igem.ru/igem/chem/pt/sukhloge.htm; Woodl, B. L., & Popov, N. P. (2006). The Giant Sukhoi Log Gold Deposit, Siberia. Russian Geology and Geophysics Vol. 47, No. 3, pp. 315-341; Distler, V. V., Mitrofanov, G. L., Yudovskaya, M. A., Lishnevsky, E. N., & Prokof’ev, V. Y. (2005). 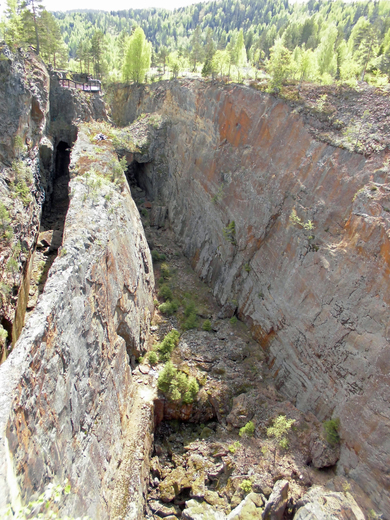 Deep structure and ore-forming processes of the Sukhoi Log gold-platinum deposit, Russia. In Mineral Deposit Research: Meeting the Global Challenge (pp. 921-923). Springer Berlin Heidelberg. Grecula, P. et al. (1995): Mineral deposits of the Slovak Ore Mountains, vol. 1, Geocomplex,p. 337. Calvo, M. (2003) Minerales y Minas de España, Vol 2. Diputación Foral de Alava. 705 pages. Stalder, H. A., Wagner, A., Graeser, S. and Stuker, P. (1998): "Mineralienlexikon der Schweiz", Wepf (Basel), p. 375. Phillips, W. (1823): An Elementary Introduction to the Knowledge of Mineralogy, 3rd ed. William Phillips (London), 535 pp. ; Hall, T.M. (1868): Edward Stanford (London), 168 pp. ; Collins, J.H. (1892): A Handbook to the Mineralogy of Cornwall and Devon, 2nd ed., D. Bradford Barton Ltd. (Truro, UK), 108 pp. ; Hill, J.B., MacAlister, D.A., and Flett, J.S. (1906): The geology of Falmouth and Truro and of the mining district of Camborne and Redruth. HSMO Publications (London), 335 pp. Pryce, W. (1778): Mineralogia Cornubiensis. Author's Publishing (London), 331 pp. ; Hill, J.B., MacAlister, D.A., and Flett, J.S. (1906): The geology of Falmouth and Truro and of the mining district of Camborne and Redruth. HSMO Publications (London), 335 pp. Royal Cornwall Polytechnic Society (1870): 38. Annual Report, pp. 30-31; Collins, J.H. (1892): A Handbook to the Mineralogy of Cornwall and Devon, 2nd ed., D. Bradford Barton Ltd. (Truro, UK), 108 pp. Dines, H.G. (1956): The metalliferous mining region of south-west England. HMSO Publications (London), Vol. 1, pp. 403-404. Pryce, W. (1778): Mineralogia Cornubiensis. Author's Publishing (London), p. 50; Hill, J.B., MacAlister, D.A., and Flett, J.S. (1906): The geology of Falmouth and Truro and of the mining district of Camborne and Redruth. HSMO Publications (London), 335 pp. Phillips, W. (1823): An Elementary Introduction to the Knowledge of Mineralogy, 3rd ed. William Phillips (London), 535 pp. ; Hall, T.M. (1868): The Mineralogist's Directory. Edward Stanford (London), 168 pp. ; Collins, J.H. (1892): A Handbook to the Mineralogy of Cornwall and Devon, 2nd ed., D. Bradford Barton Ltd. (Truro, UK), 108 pp. ; Hill, J.B., MacAlister, D.A., and Flett, J.S. (1906): The geology of Falmouth and Truro and of the mining district of Camborne and Redruth. HSMO Publications (London), 335 pp. Hall, T.M. (1868): The Mineralogist's Directory. Edward Stanford (London), 168 pp. ; Sir Arthur Russell (1949) The Wherry Mine, Penzance, Its History and its Mineral Productions. Mineralogical Magazine 28:517-533. Goley, P. and Williams R. (1995) Cornish Mineral Reference Manual. Endsleigh Publications; Hill, J.B., MacAlister, D.A., and Flett, J.S. (1906): The geology of Falmouth and Truro and of the mining district of Camborne and Redruth. HSMO Publications (London), 335 pp. Hall, T.M. (1868): The Mineralogist's Directory. Edward Stanford (London), 168 pp. ; Collins, J.H. (1892): A Handbook to the Mineralogy of Cornwall and Devon, 2nd ed., D. Bradford Barton Ltd. (Truro, UK), 108 pp. ; Hill, J.B., MacAlister, D.A., and Flett, J.S. (1906): The geology of Falmouth and Truro and of the mining district of Camborne and Redruth. HSMO Publications (London), 335 pp. Royal Cornwall Polytechnic Society (1870): 38. Annual Report, pp. 30-31; Collins, J.H. (1892): "A Handbook to the Mineralogy of Cornwall and Devon", 2nd ed., D. Bradford Barton Ltd. (Truro, UK), pp. 108. Collins, J.H. (1892): "A Handbook to the Mineralogy of Cornwall and Devon", 2nd ed., D. Bradford Barton Ltd. (Truro, UK), 108 pp. ⓘ St Austell Consols (incl. Wheal Hawkins) ? Hall, T.M. (1868): The Mineralogist's Directory. Edward Stanford (London), 168 pp. ; Collins, J.H. (1871): A Handbook to the Mineralogy of Cornwall and Devon. D. Bradford Barton Ltd. (Truro, UK), 108 pp. ; Dines, H.G. (1956): The metalliferous mining region of south-west England. HMSO Publications (London), Vol. 2, pp. 545-546; Merry, M. & Weiß, S. (2017): Nickel- und Kobaltmineralien aus der St. Austell Consols Mine, Cornwall (GB). Lapis, 42 (1), 24-26; 39-40; 62 (in German). BMS Database; R. A. Ixer, C. J. Stanley and D. J. Vaughan (1979) Cobalt-, Nickel-, and Iron-Bearing Sulpharsenides from the North of England. Mineralogical Magazine 43:389-395. Bollin, E. M., & Kerr, P. F. (1958). Uranium mineralization near Cameron, Arizona. In Guidebook of the Black Mesa Basin, northern Arizona: New Mexico Geological Society, 9th Field Conference Society Guidebook (Vol. 9, pp. 161-168). Peirce, H.W., S.B. Keith and J.C.Wilt (1970), Coal, oil, natural gas, helium, and uranium in Arizona, AZ Bur. Mines Bull. 182: 103-159 202-289; Bollin & Kerr (1958), Guidebook for New Mexico Geol.Soc., 9th. Field Conference F.P. 164-168. Gornitz, V. (2004), Grand Canyon Uranium: The Orphan Mine, Mineral News: 20(6): 7. Anthony, J.W., et al (1995), Mineralogy of Arizona, 3rd.ed. : 374; Galbraith, F.W. (1947), Minerals of AZ, AZ Bur. of Mines Bull. 153: 25. Anthony, J.W., et al (1995), Mineralogy of Arizona, 3rd.ed. : 101; Bastin, E.S. (1922), Primary native-silver ores near Wickenburg, AZ, and their bearing on the genesis of the silver ores of Cobalt, Ontario, USGS Bull. 735: 131-155. USGS (2005), Mineral Resources Data System (MRDS): U.S. Geological Survey, Reston, Virginia, loc. file ID #10029485. Logan, Clarence August (1924), Sacramento field division: California Mining Bureau. Report 20: 4; Hess, Frank L. (1927), Rare metals – cobalt: Mineral Resources U.S., 1924, part 1: 451; Murdoch, Joseph & Robert W. Webb (1966), Minerals of California, Centennial Volume (1866-1966): California Division Mines & Geology Bulletin 189: 179, 340; Pemberton, H. Earl (1983), Minerals of California; Van Nostrand Reinholt Press: 78.; Rocks & Minerals 82: 402-407. Pemberton, H. Earl (1983), Minerals of California; Van Nostrand Reinholt Press: 78, 320; Rocks & Minerals (2007): 82: 402-407. Irelan, William, Jr. (1890a), Ninth annual report of the State Mineralogist: California Mining Bureau. Report 9, 352 pp. : 47; Murdoch, Joseph & Robert W. Webb (1966), Minerals of California, Centennial Volume (1866-1966): California Division Mines & Geology Bulletin 189: 179, 340. Irelan, William, Jr. (1890a), Ninth annual report of the State Mineralogist: California Mining Bureau. Report 9, 352 pp. : 47; Storms, William H. (1893), Los Angeles, San Bernardino, San Diego Counties: California Mining Bureau. Report 11: 244-245; Sharp, W.E. (1959) Minerals from Los Angeles County, California. Printed privately, Los Angeles, California: 39-40, 89; Murdoch, Joseph & Robert W. Webb (1966), Minerals of California, Centennial Volume (1866-1966): California Division Mines & Geology Bulletin 189: 179, 340.; Pemberton, H. Earl (1983), Minerals of California; Van Nostrand Reinholt Press: 78, 320; Rocks & Minerals (2007): 82: 402-407. Dana 6: 1096; Irelan, William, Jr. (1890a), Ninth annual report of the State Mineralogist: California Mining Bureau. Report 9, 352 pp. : 47; Murdoch, Joseph & Robert W. Webb (1966), Minerals of California, Centennial Volume (1866-1966): California Division Mines & Geology Bulletin 189: 179, 287, 297, 340; Pemberton, H. Earl (1983), Minerals of California; Van Nostrand Reinholt Press: 320. Murdoch, Joseph & Robert W. Webb (1966), Minerals of California, Centennial Volume (1866-1966): California Division Mines & Geology Bulletin 189: 179, 340. Murdoch, Joseph & Robert W. Webb (1966), Minerals of California, Centennial Volume (1866-1966): California Division Mines & Geology Bulletin 189: 340. Bradley, W.W. (1939), Thirty-fifth report of the State Mineralogist: California Division Mines Report 35: 497; Murdoch, Joseph & Robert W. Webb (1966), Minerals of California, Centennial Volume (1866-1966): California Division Mines & Geology Bulletin 189: 180, 340.
ⓘ Huron River Uranium prospect (Unnamed V prospect; MRDS - 10171055) ? Dana 6:1083; Rocks & Minerals: 21: 277. The Minerals of New York City & Its Environs, New York Mineralogical Club Bull. Vol. 5, No. 1, Manchester, J.G. (1931): 88. Oen, et al:Neues Jahrbuch für Min. Abhandlungen:150:259-272; Holmes, R.J.: Geol. Soc. of America Bull. :56:1168 (1945) & 58:299-391(1947); Dunn(1995):Pt4:553. Smith, II, R. C. (1978) Cobaltite chapter in The Mineralogy of Pennsylvania, p. 96. Rocks & Minerals: 16: 407.